On the last Sunday of every month, the Prince William Conservation Alliance sponsors a nature walk at the Merrimac Farm Wildlife Management Area in Nokesville. This morning, we walked this very beautiful remote property and tallied 38 species. Of particular interest were Warblers. We found an abundance of Prairie Warblers, and what could almost be called a flock of Hooded Warblers along the area’s Cedar Run Trail, which provided the greatest concentration. A Louisiana Waterthrush, one of the Hooded Warblers, and the Magnolia provided the best views, while the others were heard rather than seen. In the forest, in autumn, an acorn drops from an oak. Soon, a bushy-tailed squirrel finds it and obeys an ageless urge to bury it to be dug up later during the spare oncoming winter. Soon forgotten by the squirrel, it remains buried through the winter, and begins to germinate the following spring. In several years, the acorn develops into a sapling, and begins the struggle for survival. 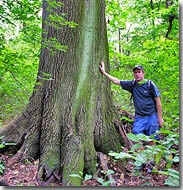 It must compete with other trees for its share of sunlight, nutrients from the soil, and water. Its leaves are bigger than those of its parents so that it can devote more energy to absorbing the necessary light and carbon dioxide than the adult trees, thus promoting faster growth. This year’s annual Bluebell Festival at Merrimac Farm (and my first) on April 15, turned out to be a great experience even though the famous bluebells were past their peak due to the unseasonably warm weather. As such, there was a greater focus on wildlife and history. 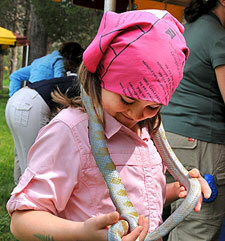 Several hundred participants, including many families with children, arrived in a steady stream throughout the day. Once greeters mentioned that Alvin the albino corn snake was available for petting, the children made a direct beeline for his enclosure. While walking along a trail at Leesylvania State Park yesterday, a half-inch long, curiously flat bright red insect caught my eye. 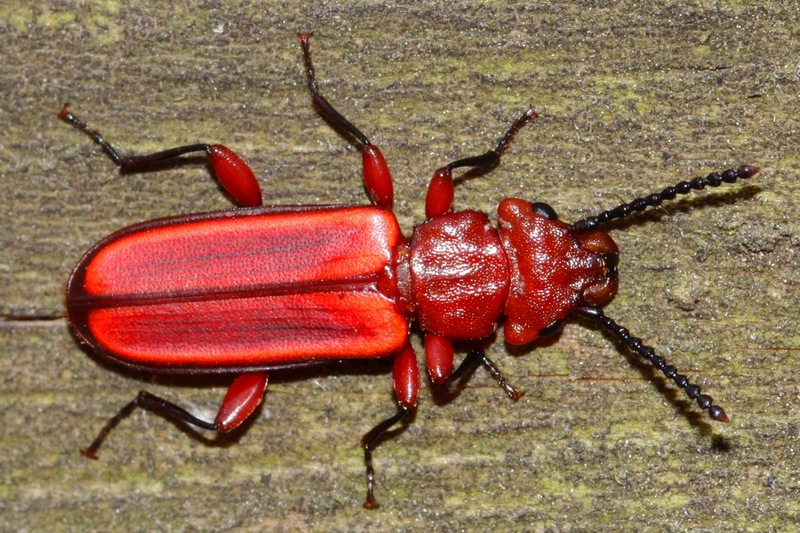 The Red Flat Bark Beetle, Cucujus clavipes, is typically found under the bark of ash and poplar. Its flat shape allows it to easily move around under bark, and sometimes even into the tunnels of destructive wood borers and bark beetles, which it likes to eat. This is beneficial, as it helps limit wood borer and bark beetle damage to the tree. The larvae overwinter from North Carolina to as far north as Alaska. Scientists have been studying the Red Flat Bark Beetle to determine how the larvae survive such cold winters. Beetle larvae produce glycerol, an anti-freeze protein, that enables them to survive to temperatures as low as -100C. The concentration of glycerol in larvae in more southerly climates is less than in larvae in Alaska, so the temperature that they can withstand is different. Alaskan larvae have a higher concentration of glycerol because they undergo more dehydration than southern larvae. According to scientists at the University of Alaska’s Institute of Arctic Biology, knowledge of glycerol could be used to create a solution to cool human organs in order to preserve them, to create a non-toxic de-icing solution for aircraft, or a concrete that will set in colder temperatures. For you ice cream lovers out there, it might even be able to be used as an ingredient that could prevent the crystals that form inside an open carton of ice cream. What a beneficial insect, and it’s pretty too. Spring is here a little early and Prince William Conservation Alliance members kicked it off with another fun and productive volunteer work day at the Merrimac Farm landscape conservation project and the Stone House. Last Saturday (3/10/2012), volunteers tore down the old fascia boards on the front porch of the house and put up new fascia. New rain gutters were also installed. In the back in the conservation project, trenches were dug for the corrugated flex pipe that was laid to connect the two rain barrels that were set up; there will be a third rain barrel installed in the coming weeks. 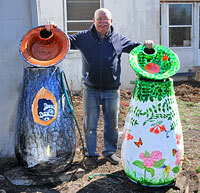 The water collected in the rain barrels will be used to water the plantings in the landscape project. Last week, I was in Vancouver, Canada, visiting my family. My sister mentioned that Snowy Owls had been sighted near Boundary Bay, about 20 miles south of Vancouver, so we went out to see them. For those of you who are Harry Potter fans, Harry’s owl Hedwig is a Snowy Owl. Snowy Owls breed on the Arctic Tundra, and typically winter there. They nest on the ground, and fiercely defend their nests from predators, even wolves. 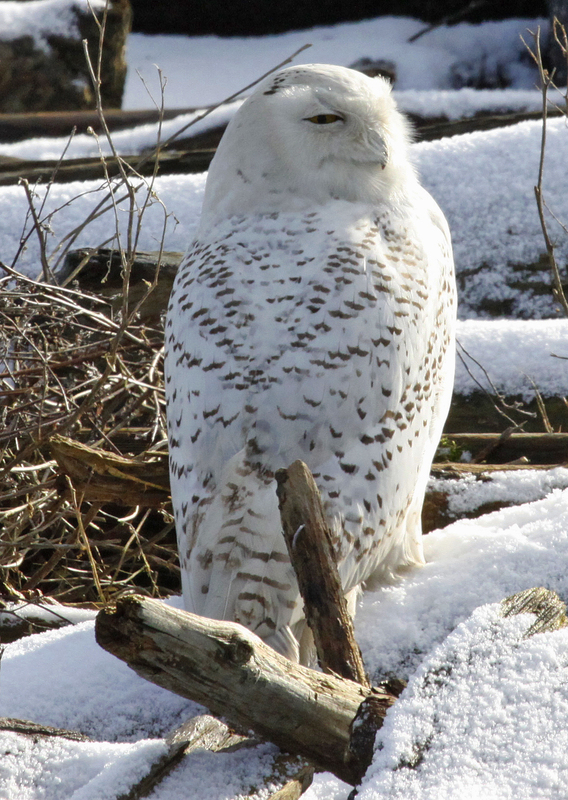 Snow Geese, which sometimes nest near on the ground near the Snowy Owl, appear to derive some protection from predators because of the presence of the Snowy Owls. The Snowy Owl’s primary food source is lemmings, but they also eat mice, voles, ducks, hares and fish. A Snowy Owl can eat 1600 lemmings in a year. They have been known to follow traplines in the north, eating the animals that are caught in the traps. They swallow small prey whole, and their strong stomach juices digest the flesh. Bones, teeth, fur, etc., which are not able to be digested, are regurgitated in pellet form 18 to 24 hours after feeding. Every few years, Snowy Owls fly south in large numbers in what is known as an irruption, possibly when Arctic food sources are scarce. Unlike most other owls, they are easy to spot. For one thing, they don’t roost in trees, preferring to perch on logs in the open. Secondly, they are diurnal, so are seen during the day. Plus, they are stunning white birds with yellow eyes, about 2 feet tall, with a 5 foot wingspan. There were hundreds of people watching the owls. 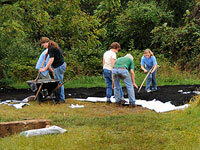 I enjoyed being with so many other nature lovers, most of whom were respectful and well-behaved. But there are always a couple of jerks who feel that getting a good picture is so important that it is acceptable to get too close and harass the birds. It was refreshing to see people telling off these idiots. In a two hour period, I saw more owls (30) than I’ve seen in the rest of my life. It was a wonderful nature experience to start out the year. Together a team of nearly 30 volunteers recorded 81 species at the Nokesville Christmas Bird Count on December 26 2011 (species list below the fold). 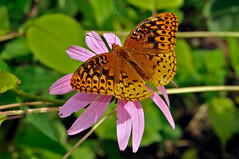 Previous counts ranged from 82 species in 2008 to 86 species in 2009. Some species seen previous years were noticeably absent, including Red-breasted Nuthatches, Purple Finches, Horned Larks and Bobwhite. Sadly the Brewers Blackbirds, known to frequent a farm on Fleetwood, were nowhere in sight. While walking in Julie Metz Wetlands earlier this week, I spotted a brown mass on a leaf. It looked like a large bird dropping, and I thought it could also be a half eaten frog or toad. I whipped out my trusty camera with macro lens and took a picture. 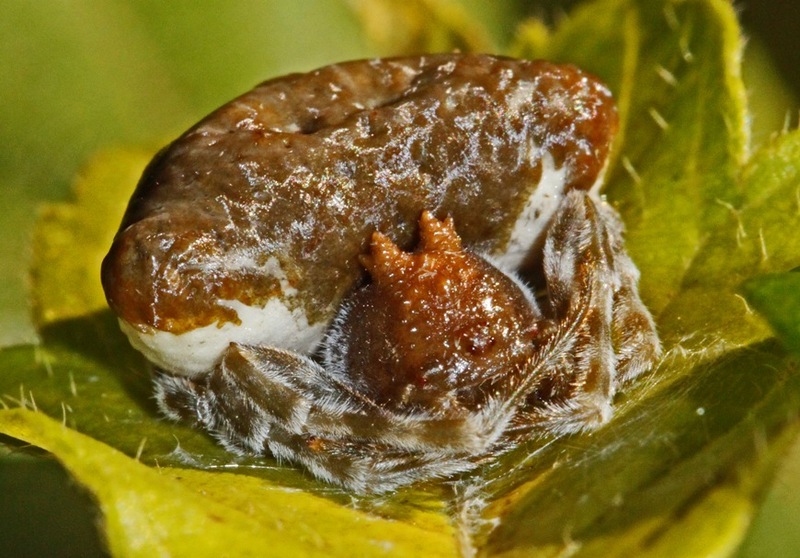 To my surprise, it was a very special spider called the Bolas Spider, in the genus Mastophora. Bolas Spiders are so named because they capture their prey by using a sticky blob of silk called a bola on the end of a silk thread. In the non-spider world, a bola is a weight on the end of a rope, used by South American cowboys as a sort of lasso. The cowboy entangles the cow’s legs with the rope and weight, stopping the cow from running away.